Hebrew literary historian; born in Salonica about 1618; died about 1685. Conforte came of a family of scholars. His early instructors were R. Israel Ẓebi, R. Judah Girasi, and R. Baruch Angel. 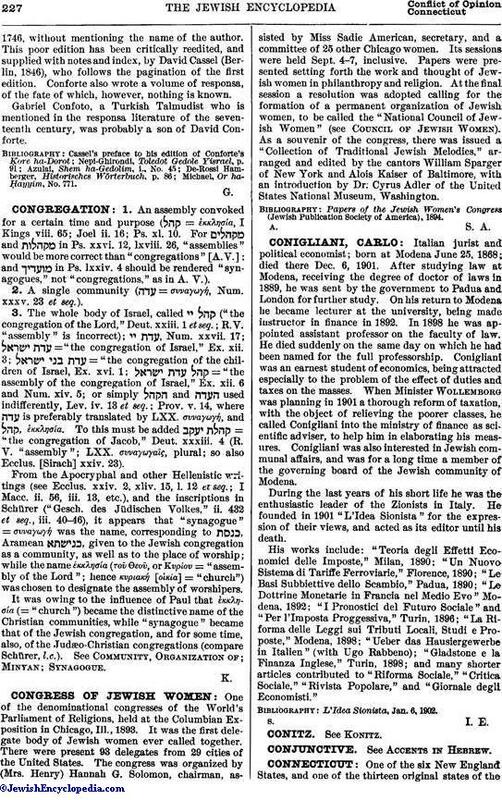 As a young man he studied the Cabala under R. Jefeth the Egyptian, and philosophy under R. Levi Pasriel. His chief teachers, however, were Mordecai Kalai and Daniel Estroza. Conforte married a granddaughter of Menahem de Lonsano. He journeyed twice to Palestine, once in 1644, alone, and a second time in 1652, when, together with his family, he settled in Jerusalem, founding there a bet ha-midrash. In 1671, however, he was in Egypt, where he occupied the position of dayyan. He is also known to have been in Smyrna. His chief work is a literary chronicle now known by the title "Ḳore ha-Dorot," which contains the names of all the teachers and writers from the close of the Talmud up to his own day. This chronicle is divided into three parts, the first two of which, referring to the time before the expulsion of the Jews from Spain in 1492, are very short. The third part is divided into eleven generations, and is not systematically arranged. 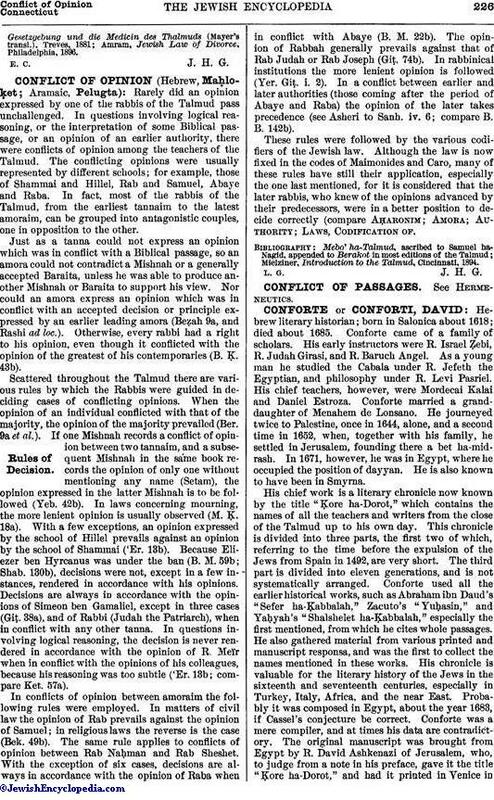 Conforte used all the earlier historical works, such as Abraham ibn Dand's "Sefer ha-Ḳabbalah," Zacuto's "Yuḥasin," and Yaḥyah's "Shalshelet ha-Ḳabbalah," especially the first mentioned, from which he cites whole passages. He also gathered material from various printed and manuscript responsa, and was the first to collect the names mentioned in these works. His chronicle is valuable for the literary history of the Jews in the sixteenth and seventeenth centuries, especially in Turkey, Italy, Africa, and the near East. Probably it was composed in Egypt, about the year 1683, if Cassel's conjecture be correct. Conforte was a mere compiler, and at times his data are contradictory. The original manuscript was brought from Egypt by R. David Ashkenazi of Jerusalem, who, to judge from a note in his preface, gave it the title "Ḳore ha-Dorot," and had it printed in Venice in1746, without mentioning the name of the author. This poor edition has been critically reedited, and supplied with notes and index, by David Cassel (Berlin, 1846), who follows the pagination of the first edition. Conforte also wrote a volume of responsa, of the fate of which, however, nothing is known. Gabriel Confoto, a Turkish Talmudist who is mentioned in the responsa literature of the seventeenth. century, was probably a son of David Conforte. Michael, Or ha-Ḥayyim, No. 771.